Lois Ehlert is a children’s book illustrator who also worked as a graphic designer in Milwaukee, Wisconsin. 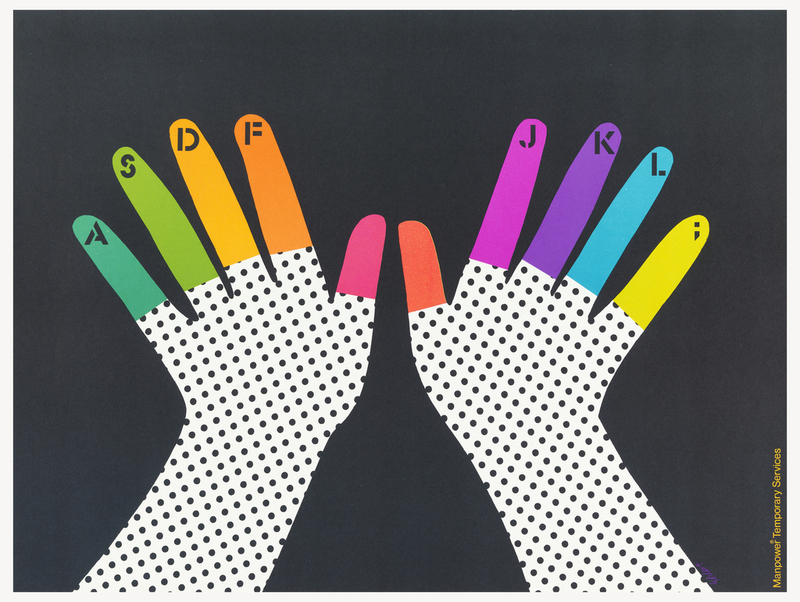 In the late 1970s, she created this remarkable series of posters for Manpower Temporary Services, a Milwaukee-based agency that connects temporary office workers with companies. Ehlert derived her bright, playfully simplified images from everyday office culture. Poster, Now is the time for all good women to come to the aid of their country,1979. Designed by Lois Ehlert for Manpower International (Milwaukee, Wisconsin, USA). Offset lithograph. Approx. 61.1 × 45.7 cm (24 1/16 × 18 in.). Gift of Lois Ehlert, 1991-69-34. Poster, ABCDEFGHIJKLMNO, 1979; Shorthand, 1979. Designed by Lois Ehlert for Manpower International (Milwaukee, Wisconsin, USA). Offset lithograph. Approx. 61.1 × 45.7 cm (24 1/16 × 18 in.). Gift of Lois Ehlert, 1991-69-35. Poster, Manpower Temporary Service – Office Sweet Office, 1979. Designed by Lois Ehlert for Manpower International (Milwaukee, Wisconsin, USA). Offset lithograph. Approx. 61.1 × 45.7 cm (24 1/16 × 18 in.). Gift of Lois Ehlert, 1991-69-38.